The Golden State Warriors opened their quest for a third title in four years with a commanding victory 113-92 over the San Antonio Spurs in game 1 of the first round of the Western Conference playoffs. The Warriors both literally and figuratively limped into the playoffs this season, finishing out of the top seed in the Western Conference for the first time since 2014. Injuries to key players resulted in a disappointing finish to the regular season, and the buzz around the league is that they are more vulnerable than they’ve been in a long time. Stephen Curry has been ruled out of this first round matchup, so everyone on the roster needs to elevate their game to alleviate the negative effects of that absence. While the Warriors will be without one of their stars, the Spurs will also be without a player arguably more crucial to their team’s success. Kawhi Leonard’s health status has been something of a controversial subject in San Antonio in recent weeks, but regardless of any speculative drama, the underlying fact of the matter is that he was not on the court for game 1, and likely won’t suit up for the series. 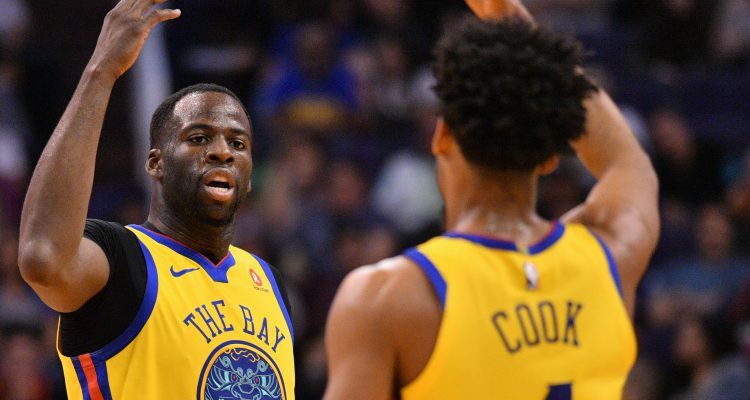 The Warriors went with a unique starting lineup of Andre Iguodala, Klay Thompson, Kevin Durant, Draymond Green, and JaVale McGee. The first game of a series offers a glimpse of what the rotations will be throughout the rest of the series, and this was a strong indicator that McGee will be getting more playing time at center than Zaza Pachulia. The Spurs went with a relatively small starting lineup of Patty Mills, Dejounte Murray, Danny Green, Kyle Anderson, and LaMarcus Aldridge. Pau Gasol started 63 games this season for the Spurs, but he came off the bench this game as Gregg Popovich decided to swap height for speed in his starting lineup. McGee certainly rewarded Steve Kerr’s decision to start him over Pachulia. He asserted himself immediately, scoring 9 points and going 4-5 from the field in the first quarter. The Warriors were up 28-17 by the time the first quarter concluded, but all things considered, it could have been a lot worse for the Spurs. Manu Ginobili hit a 3-pointer at the buzzer to end the first quarter, which did its part to partially salvage an absolutely brutal beginning for the Spurs. The Warriors shot 65% in the opening quarter, while the Spurs shot just 35%. 3 of the 7 field goals the Spurs made were 3-pointers, which made the deficit smaller than it probably should have been. The Warriors assisted on 8 of their 13 field goals in the first quarter, setting a tone early with selfless ball movement that their offense has been predicated on for years. The Spurs scored just 2 points in the paint in the opening quarter, as the Warriors were playing solid interior defense. The Spurs didn’t go to the free throw line until nearly midway through the second quarter, but they were hanging around due to their perimeter shooting. Without Curry, Durant needed to have a big game, and he delivered. By halftime, he already had 16 points, 6 rebounds, and 5 assists. He wasn’t done yet, either. The Warriors finished the first half up 57-41. During that first half, the Warriors shot 59% from the field, while the Spurs were limited to a paltry 34%. However, the Spurs managed to shoot 55% from 3-point range, which was truly their saving grace throughout the first half. The Warriors outscored the Spurs 22-4 in first-half points in the paint. However, the Warriors were just 3-9 on 3-pointers in that opening half. The Spurs opened the third quarter on a 9-2 run and threatened to claw their way back, but the Warriors quickly stomped out any potential comeback. McGee picked up his fourth foul about midway through the 3rd quarter and received a standing ovation for his terrific performance when he was subbed out for Kevon Looney. The Warriors stretched their lead to 20 points for the first time by the end of the third quarter, and the fourth quarter seemed a mere formality by the time the buzzer sounded to conclude the third quarter. The Warriors had a very comfortable 86-63 to begin the fourth quarter in front of a raucous Oracle Arena crowd. The Warriors maintained about a 20 percent gap in field goal percentage through three quarters, shooting 57% from the field while the Spurs languished at 37%. The Warriors also closed the gap in terms of 3-point shooting, as they improved to 7-16 from downtown by the end of the third quarter. Illustrating the fluidity of their offense and their stingy defense, the Warriors had more assists by the end of the third quarter than the Spurs had total field goals. Thompson shot the lights out and finished with 27 points to lead the game on a remarkable 11-13 from the field. Durant and Green both flirted with triple-doubles. Durant finished with 24 points, 8 rebounds, and 7 assists, while Green finished with 12 points, 8 rebounds, and 11 assists. McGee finished with 15 points, 4 rebounds, and 2 blocks, and has seemingly cemented his role for the rest of this series. It was admittedly difficult to critique any aspect of the Warriors performance by the time the final buzzer sounded. Over the course of the game, they shot 54% from the field, while holding the Spurs to just 40% from the field. The Warriors shot 46% from downtown, and if there’s one part of the game the Warriors can realistically improve on over the course of this series, it’s their 3-point defense. The Spurs shot 41% from 3-point range, which conversely was one of the few bright spots of their performance. The Warriors also finished with an outstanding 33 assists, and their offense was anything but stagnant. The final outcome never seemed in doubt, and it was a great way for the Warriors to silence their increasingly vocal critics.